Sorry for this portrait being an NDH stamp. 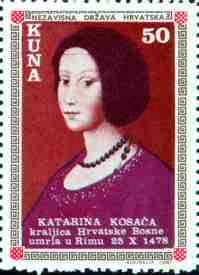 It still is a good likeness of Queen Katarina the last queen of Bosnia before the Ottomans took over. I have finally figured out what the deal s with Serbian objections to her being recognized as the last queen ofosnia. There was a princess from Serbia who was married to the king that the Ottomans intaalled as a temporary puppet regime. That regime however DID NOT, repeat DID NOT represent Bosnia as an independant country, at least as far as any one in the era recognized a free country, let alone our own times. I imagine that the Ambassador of BiH in Rome will have placed flowers at her last resting place, and as usual people in Jajce will hold a special Mass and some festivties. FTV usually covers at least what goes on in Jajce on this day. Oslobodjenje usually has an article about tributes paid by the Ambassador from BiH in Rome, and a side bar thing about Queen Katarina. ere in the Yakima Gulag, it is a lovely day. I am enjoying my new place very much and have been getting to know the people here. I like waking up hearing the little birds. Most of the people here have either a dog or a c at. I dont because of my allergies, but that doesnt stop me from petting the little dogs on their way in or out from their walks. personally can't have either because of my allergy to both. I moved recently. I was staying in a friend's basement and am very grateful for her. She did not have the kind of internet access that allowed me to use the netbook, I had to post by e-mail from my phone instead. At least I had access. Now I have full access. I put in internet the day after I moved in. I am still fairly tired. It is really two moves in pretty quick succession. The place I live is a place for people who are low income and either over 62, or disabled. I happen to have several disabilities. I really like the place. It is light, airy, but in Winter it will be well heated. the heaters are a variant of a type used in Europe actually. I am located close to two small stores and also a big store with a pharmacy. This is good because in Winter I will not wish to go too far away. I am glad to have been able to move before Winter set in. I am also glad to have a nice place with enough room with reliable plumbing, a good fridge and a good stove.I have not always had those things. I also have mostly pretty nice neighbors and the management is good. things are well maintained. That is very important.